Do you remember that feeling of being 18 going off to college? Moving into your first apartment? Who was your first roommate? Did you have a part time job while going to school or did you live off of scholarships and student loans? I remember my first apartment (right across from the railroad tracks), my first roommate (a gril who was a couple of years older than me), and yes I worked part time (working for Hobby Lobby) to supplement the student loans and scholarships. In other words I was like every other college kid I knew, broke and over exhausted! Due to a poor college kid’s budget my meals consisted of three main foods: Ramen Noodles (at the end of the pay period or semester when my bank account was really low); mac and cheese (in the middle of the pay period when I had some cash but needed to make sure I had enough till pay day); and Hamburger Helper (when, well, the day after pay day because we all know pay day meant a real meal at a real restaurant)! Hamburger Helper was also the go to meal for friends (and dates) to make as a special meal! Haha! Did they get an “A” for effort??? Well I guess back then they did! LOL! Even though these ‘comfort foods’ (if you want to call them that!!) bring back memories, I also crave them every now and then (honestly who doesn’t)! So I was so happy when I saw this kicked-up. healthier, just as easy and cheap, version of ramen noodles. Totally full of flavor and not loaded down with all that extra sodium (yay)! All I can say is where was this recipe way back when I was saying “Whoop!” and “Gig ’em” at Saturday football games! In a 12-inch nonstick skillet, heat 2 tablespoons of the canola oil over medium to medium-high heat until it is hot and rippling. Season the chicken lightly with salt and pepper. Add the cubed chicken to the pan in a single layer and cook, stirring occasionally, until the chicken is browned and cooked through, 5-7 minutes. Remove the chicken to a medium bowl. Add the last tablespoon of oil to the skillet and heat until hot and rippling. Add the red bell pepper, peanuts, peas and carrots; and cook until softened, 2 to 3 minutes. Remove the mixture into the bowl with the chicken, trying to leave as much oil as possible behind in the skillet. Add the garlic, ginger, red pepper flakes and sesame seeds to the remaining oil in the skillet and cook over medium heat, stirring constantly, for about 30 seconds to 1 minutes. Stir in the chicken broth. 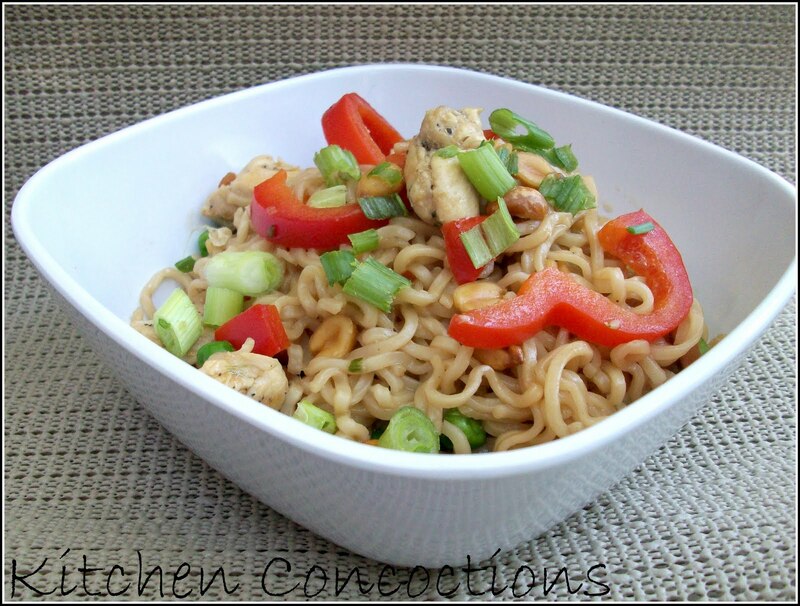 Break the bricks of ramen into small chunks and add them to the skillet. Bring the mixture to a simmer and cook, tossing the ramen constantly with tongs to separate, until ramen is just tender but there is still a bit of liquid in the pan, about 2-4 minutes. Stir in the hoisin sauce, vinegar, and soy sauce and continue to simmer until the sauce is slightly thickened, about 1 minute. 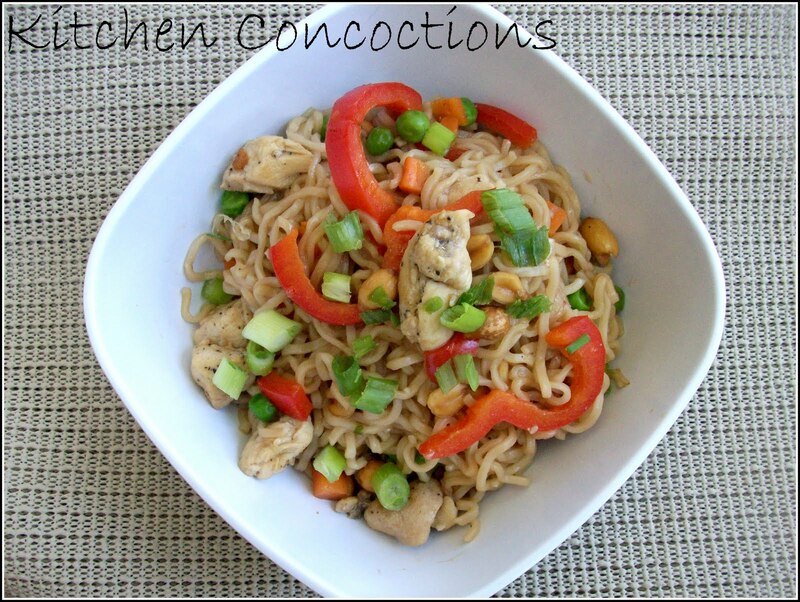 Stir in the chicken, vegetables and peanuts. Sprinkle with green onions before serving. For some reason, the thing I remember making the most in college was cakes from cake mixes… But this sounds great!! Looks wonderful! Nice blog. I'm a Texas girl too. I'm following. This looks perfect for a lazy Saturday lunch!